When Brent Williams, Senior Emergency Medical Services (EMS) Advisor for the First Responder Network Authority (FirstNet Authority) enrolled in an emergency medical technician (EMT) class in the late 1970s, advances in EMS were taking off. He pursued his growing interest in the field and signed-up for a first-of-its-kind paramedic class offered in Saginaw, MI. Brent’s passion for helping others led him to accept a position with the Ingham County (MI) Sheriff’s Office serving as a law enforcement officer. After 11 years in law enforcement, Brent’s career path expanded to focus on how ever-evolving technologies can help meet the needs of first responders and the communities they serve. 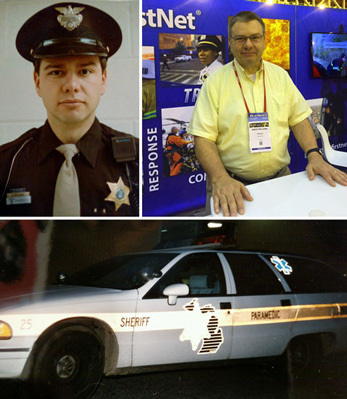 Before joining FirstNet Authority, he served as an EMS instructor at the Lansing Community College, sharing his knowledge from the field. Brent also served as an EMS Radio Communications Consultant for the Michigan’s Department of Health and Human Services’ EMS and Trauma System section. Soon after, he accepted a position to serve on the Homeland Security SAFECOM Emergency Response Council. Since joining FirstNet Authority in 2015, Brent has spent his time crisscrossing the country representing FirstNet Authority at different EMS meetings. He enjoys talking with other EMS professionals about the ways that technology is advancing emergency care in the field. “With FirstNet deploying across the country, many more functional technologies are now possible in the field – and that improves patient care exponentially,” says Brent. How has technology changed since your career began in the 1970s? I started my career as a first responder just as the EMS field was also getting its start in many parts of the country. Technology has always been around in some form for EMS, but now it’s smaller, lighter and easier to use. Take the EKG for example - heart-monitoring technology 40 years ago was very basic and found in large, heavy machines that monitored hearts by watching a dot bounce across the screen. Compare that to today’s portable, handheld EKG monitors - we now can run diagnostic testing with 12-leads on state-of-the-art monitors. Of course, all this great technology is only as good as the broadband network available – that is where FirstNet’s reliable and resilient wireless broadband can help advance these new technologies. What are some other ways FirstNet could help EMS personnel in the field? EMT’s rely more and more on broadband to exchange real-time audio and video feeds with hospitals during an emergency or while transporting a patient to a medical facility. A reliable broadband connection through FirstNet makes -it possible to use the newer mobile imaging tools such as ultrasound or CT scans, which can improve decision-making and administer care sooner. Point-of-care labs are also now possible with a strong broadband connection – EMT’s can conduct testing outside a lab and closer to the patient – speeding up lab results and allowing for quicker diagnoses and treatment. FirstNet provides us with that connection that brings many of the resources of hospital-based medicine to the field— and that ultimately helps us reach our goal of improving care for the patient. What do you envision to be FirstNet’s biggest legacy with EMS? Now that FirstNet is being deployed in more cities and counties across the nation, I could see community paramedicine programs expanding into areas where they couldn’t reach before. EMS now has the ability to reach the chronically ill and provide primary health care right in people’s homes. With FirstNet providing mobile access to video and images, combined with the ability to share these images immediately, EMTs can perform a wide range of services for patients who may be homebound and need routine medical care and monitoring. FirstNet is helping to expand the role of EMS beyond emergency situations into primary care in the field. How will FirstNet help EMS reach rural areas? FirstNet will be a game changer for EMS reaching rural areas. The network will increase situational awareness for EMTs and allow for the transfer and receipt of medical information over a secure, dedicated and prioritized network. Having the ability to connect patients to medical staff who can diagnose the situation remotely will increase a patient’s access to care without traveling great distances or while en route to the hospital. How has your role at FirstNet changed since you began in 2015? When I first started at FirstNet Authority, we spent a lot of time educating public safety about our vision. Now that FirstNet is here and in the initial deployment phase, that role has expanded to include letting public safety agencies, cities and counties know that their dedicated network is a reality. I also enjoy discussing what truly makes FirstNet their network – a dedicated communication platform built for their specific needs. The FirstNet public-private partnership is giving public safety what it asked for with the FirstNet solution – by building a nationwide network dedicated to public safety with priority and preemption. Now, with the launch of the FirstNet core built on physically separate hardware, users have the enhanced security and reliability they need to help them stay connected when it matters most. Now that FirstNet is here, what message do you have for the EMS community about the network? Also, as more public safety agencies start using FirstNet, I look forward to hearing from them about creative ways to use the network to help them with their lifesaving mission. The most creative applications usually come from the first responders in the field, suggesting ideas for new tools that we haven’t thought of yet. It is an exciting time for public safety and I look forward to continue to work with my EMS colleagues as their network is deployed!